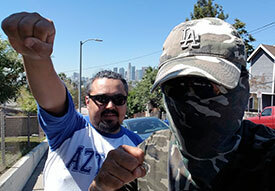 Militant Angeleno: Burritos: What's The Big Deal? One of the Extremist's co-workers, "one of those people" who originally came from out there in California kept whining about how he can't find a decent burrito in New York City. After his self-absorbed self finally shut up, the Extremist, who never really had this Mexican food before, wanted to see what was all the rage. So first up, the Extremist Wiki'ed up "Mexico" and discovered that it was a real country after all, located south of the USA (if you wanna consider places like Texas, Arizona or California the USA, LOL!). All this time the Extremist thought "Mexico" was some fictional place invented by Hollywood. Cause let's face it, everything that comes from that place is fake, and have you ever seen an actual Mexican? But anyway, while walking down 34th St. on his lunch hour on Monday, the Extremist happened upon a placed called "Qdoba Mexican Grill" so he dropped by to see what it was all about. He ordered an Ancho Chile BBQ Burrito, which took forever, but when he had it, it wasn't very impressive. Is this what Californians pass for food? Come on! No wonder why they don't make any decent pizzas out there. They don't know how to appreciate real food. One of the Extremist's Queens-based accomplices tells the Extremist that there's some good Mexican joints near his part of town, as he went to college out west, but the Extremist is just gonna pass for now.